Indoor child toys can range from video games, board games and indoor activity toys. With growing concern about the amount of children’s physical activity and the rising rates of obesity, here you will find indoor activity toys that will keep your child active be it rain or shine. 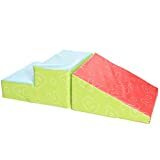 The durability and flexibility of these toys are factors when choosing specific toys as are their educational and fun values. There are many physical activities that are fun and educational that can be enjoyed in the home. Along with a little imagination even the simplest of toys can become an energy burning, fun game. We all know how much energy little ones have! There has been much focus in the recent media on the rising levels of child obesity and the decrease in the number of children participating in physical activity. The aim of this media focus is to attempt to educate parents into finding fun games that will help their children enjoy and participate in physical activity. The trick they say to engaging children in physical activity is to get them involved from a young age. It is all well and good encouraging outdoor activities but how do parents of children who do not have a safe or large enough garden help their children get active? Also, what about those all too frequent rainy days? I doubt any parent wishes to just place their child in front of the television or video games in these circumstances. The toys you’ll find here reflect the above circumstances. One of the main points to look for when choosing an indoor child toy is to try and find one that is engaging and brightly colored. Keep DIY away from your little ones. With many Indoor Child toys some assembly is required that may involve small parts. Check these do not “walk away” with your toddler or, even worse, be swallowed. It’s usually safer and calmer to complete assembly before introducing your toddler to the toy. Always watch your children while they are playing on these indoor child toys. Its all too easy for children to fall off and bump their head. Ensure that you have enough room for these toys and that there are no dangerous objects in their vicinity for kids to fall on. It’s preferable to use these toys in a carpeted/ soft surfaced area, in order to cushion any minor scrapes or bumps. Durability and flexibility are important along with the ability to be compacted for storage. 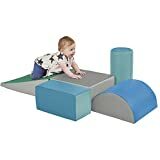 If you have the room indoors then a toy that can fit more than one child on at a time may be useful for when your little ones have friends over. The only small parts that are in these toys are used in their assembly – by a grown up. Please remember this when setting up your toy. 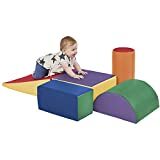 These toys should encourage physical activity play and sharing (taking turns to go down the slide) and imaginative play (king of the castle at the top of the slide). There are major campaigns at present attempting to get children away from computer games and the television and outside where they can engage in physical activity. It is important to encourage this physical activity from as young an age as possible. Even on rainy days there are Indoor activity toys that are suitable for various ages and help to keep you child happy healthy and burning off all that excess energy that little ones have. For local and national information on activities in your area contact your library or your child’s nursery. You can search the internet for more information on child health, physical activity and obesity – see our Toddler Links. This compact fold down slide is perfect for use indoors and outdoors. It is so compact it can be taken on trips and stored easily in the home or in the back of the car. This indoor child toy is suitable for taking to the beach and on picnics to keep kids occupied. It would also be great fun at a child’s birthday party. 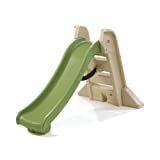 Designed in “backyard colors” children will find the slide very appealing and want to play on it all day. I like this toy. I find it versatile and user friendly. It’s fun for the children as well as good for storage. Indoors or outdoors the children will love it. It’s a must for keeping children busy in the summer months or occupied inside the house on those rainy days when they want to go out and play. Inspired by the bi lingual video of Dora the Explorer and her pals, ask your children to make and create a song and a dance using some of the ideas from Dora the Explorer. You never know, they may pick up some bilingual talents! Dancing is always a great form of exercise and enacting actions and movements can reinforce the meaning of the words describing them. This is an interactive video. Dora is bilingual, speaking and singing in English and Spanish. 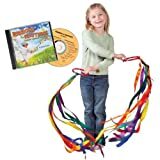 Suitable for many ages, this video encourages dancing, singing and swinging. A fun activity packed educational video. This cartoon adventure aimed at young preschool children has the setting of a simulated computer game. It’s interactive with colorful animation, sing along and repetition. Dora and Boots (her monkey friend) solve small problems on their journey. Dora is bilingual, speaking primarily English and offering a new Spanish word or phrase every episode. The series helps children to solve memory tasks and cognitive tasks in which they must use their problem solving skills to help Dora. Young viewers are presented with various challenges and activities throughout the video. This indoor child toy encourages children to be come interactive with Dora singing and dancing and practicing Spanish words. A great indoor activity toy. A must for a rainy day, this is my favorite toy in this category. I feel it would be fun, exciting and most of all enthralling for children. With the bright colors and the interesting characters children will be entertained for hours. This toy provides three activities in one unique rider. This toy includes a bouncing action with inflatable ball, a pivoting teeter-totter arm and a rider-controlled rotation. It brings together three popular activities bouncing, rocking and twirling. This rider has all the features of a mini play ground. The stay-put base must be weighted with a minimum of 90 pounds of dry sand (not included). This toy is suitable for use by children weighing under 70 pounds. Measures approximately 45″ x 24″ x 32″. 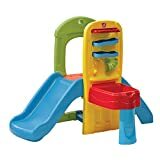 The bright colors and range of features will make it every child’s favorite. It’s good for keeping children active indoors and outdoors. Due to its size it may not be suitable for everyone for indoor use. A miniature playground in your living room! So a good investment for your toddler. 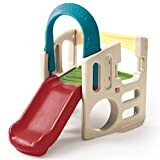 Is there an alternative to Indoor Child toys ? You’ll find some interesting alternatives to Indoor Child toys in our review of Toy Candy machine or you may select another toy category from the sidebar. Lord and lady of the rings. This simple yet fantastic toy consists of four streaming rainbow ribbons attached to sturdy brass rings. This may be considered solely a girl’s toy. It would, however, be suitable for young boys who will also enjoy running and playing with these wonderful, rainbow colored, ribbons. Suitable for indoor or outdoor use. The ribbons are 25” in length and the rings are suitable for ages 2 and up.